Take some video of the beaches and then head back to the office. The idea seemed simple enough at the beginning of the day. I headed out with my new phone, one capable of live streaming video, anticipating an outing of about one to two hours. Our headquarters in on the island of Clearwater Beach, so finding nice subjects to photograph and video is pretty easy. I had someone from the office drop me off at the north end of the public roads and set off with my camera running. I didn’t have much video of that area because it is not right outside our door so I figured I would treat our Facebook fans to some new sights. The day was sunny with a few clouds and the water and sand looked great. I headed north, away from the areas I normally traveled, just to make sure the content was fresh. The breeze coming in off the Gulf of Mexico cooled me while the sun above warmed me up. The effect was very pleasant. It should come as no surprise that the longer I walked, the more I enjoyed my time in the outdoors. I walked quite far, and since I’d done the hike before, I had a general idea of where I was. A long way up the beach it occurred to me that by going a little bit farther, I might reach the point where Clearwater Beach merged with Caladesi Island State Park. That’s when I decided to go for it. It was a perfect beach day, so why not? The problem was that to go ahead with my plan meant not going back to the office. Sure, it was my job to collect images of the area, but running away from the office was a new trick I hadn’t tried before. Would it work out? I took my chances and went for it. Before too long I reached the first landmark. 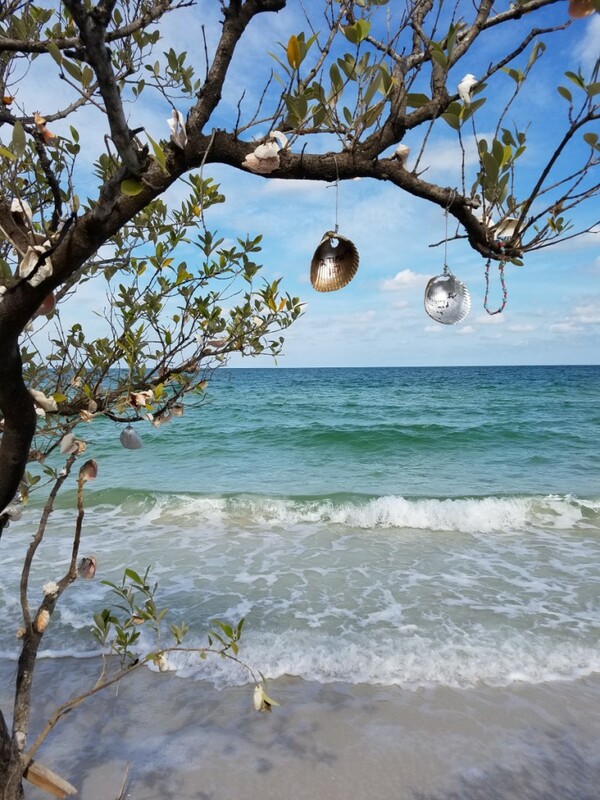 On the northern end of Clearwater Beach is a what we call the Shell Tree. 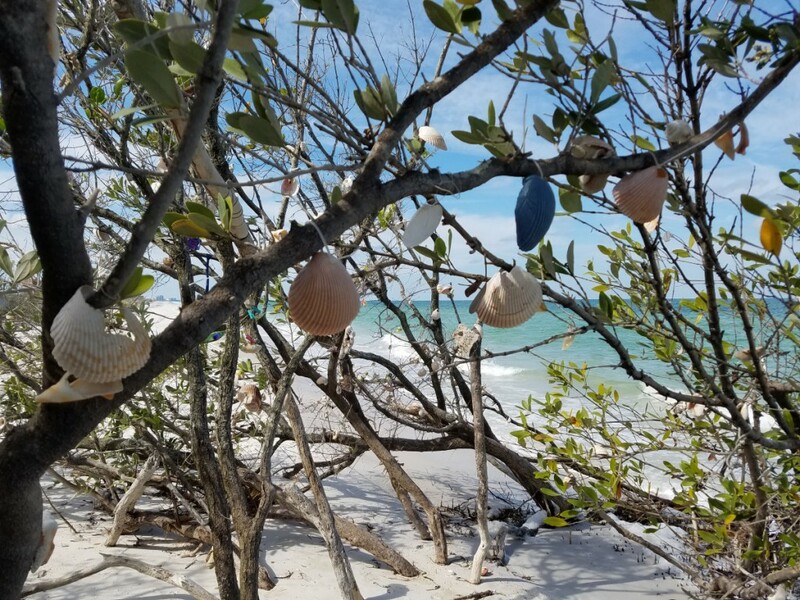 It is nothing more than some mangrove bushes but visitors have been hanging seashells on the trees for years. Most are ordinary seashells but others have been hand painted with colors or with personal messages. Some show the names of couples while others commemorate lost loved ones. Others indicate when visitors took their Clearwater Beach vacation. The result is a fun site to visit and, hopefully, interact with. I passed through the trees and continued northward. It wasn’t long after the shell tree that I came to the park sign indicating that I had reached Caladesi Island State Park. The great thing about this area is that not many people reach the location because of the effort to arrive. The only two means of getting there are to walk quite a long way or to arrive by boat. A few people were present, but once they walked by, I was alone again at the border of the two islands. A waterway once passed between the two islands, back when they received their separate names, but a hurricane some forty years ago filled the channel in with sand. In the present, only those who know the history of the islands understand why the sand they walk on bridges two islands together. At that point, so far north of the office, I knew that going back would be more trouble than going forward. I did not realize at the time that I was wrong. I forged ahead, passing onto Caladesi Island. The beach was remarkable, of course, and completely wild. 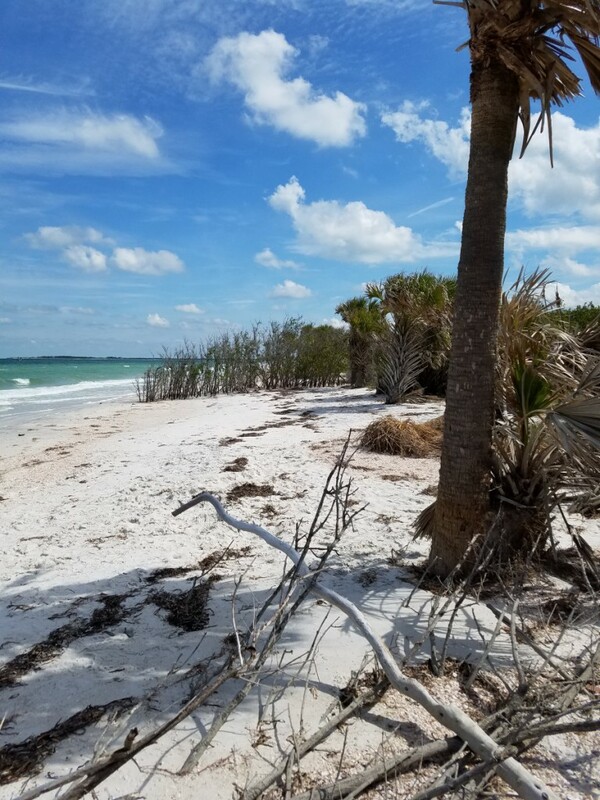 A forest of palm trees grew on the inland sands while a few stray trees attempted to stake a claim to the shoreline, which is risky business for a plant with such a small root system. A few had fallen to high tides. Not far ahead, however, I saw people gathered among beach chairs and umbrellas. That marked the location where the Caladesi Island Ferry dropped off visitors to enjoy the beach for a few hours. I reached the spot and headed inland. The aside from the ferry off the island, there was a concession stand, and I was hungry. I first secured a seat on the ferry and then went to get the hot dog I had anticipated. Well, the Caladesi Island concession stand doesn’t serve hot dogs. How is that possible? I settled for a chicken sandwich. The ferry captains were ready to go and so helped to put my order on rush, which was very nice of them. With my chicken sandwich in hand, I boarded ferry and we set out right away. The ride between the islands is fantastic. 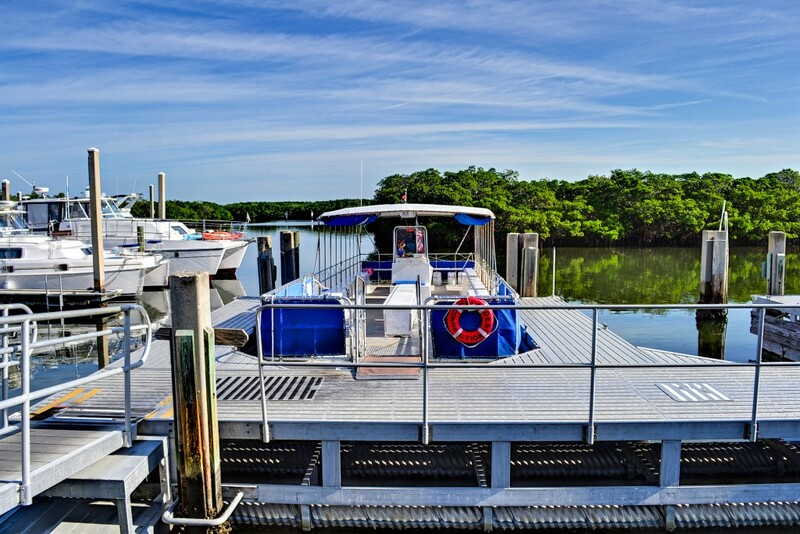 The ferry travels through the mangrove bayous of Caladesi Island that then open onto the waters of St Joseph Sound. You are provided views of the small islands that dot the harbor and get to see a host of different watercraft playing on the water. The only boat that is doing any serious business is the ferry. Every other boat on the water is out there for sightseeing or fishing. Still, the waters are full of jet skis, motorboats, kayaks, paddleboards, and sailboats. It’s a actually a lot of fun to watch that many people out having their own fun. 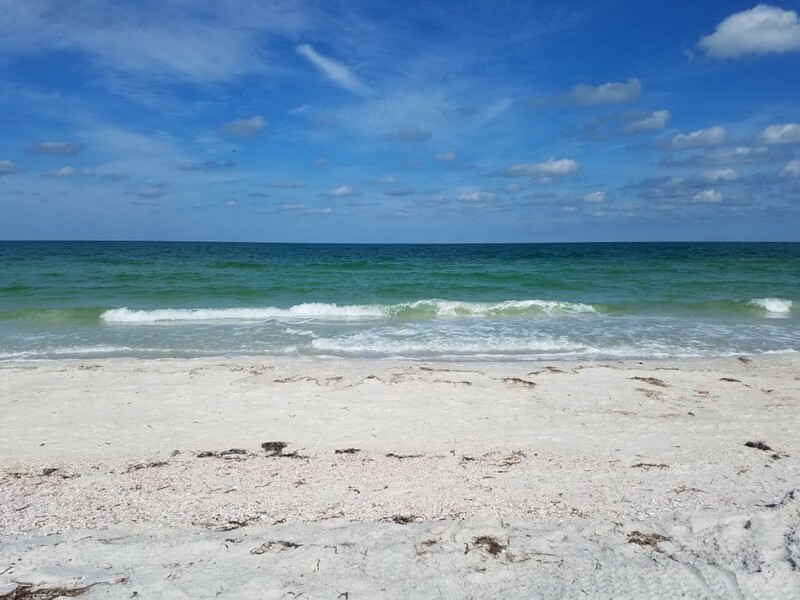 The other end of the line is at Honeymoon Island State Park. The captain helped me pay my ride ticket because explaining a one-way ticket proved kind of difficult. Apparently, no one does that. The confusion was understandable, since a round trip walk like the one I was taking was fairly out of the question. While the walk of the beach might workout, the conditions were about to change, and so was the distance. You see, although I was as far north as I was going to go, I was not yet at the half way point. That’s when I learned something I did not know. 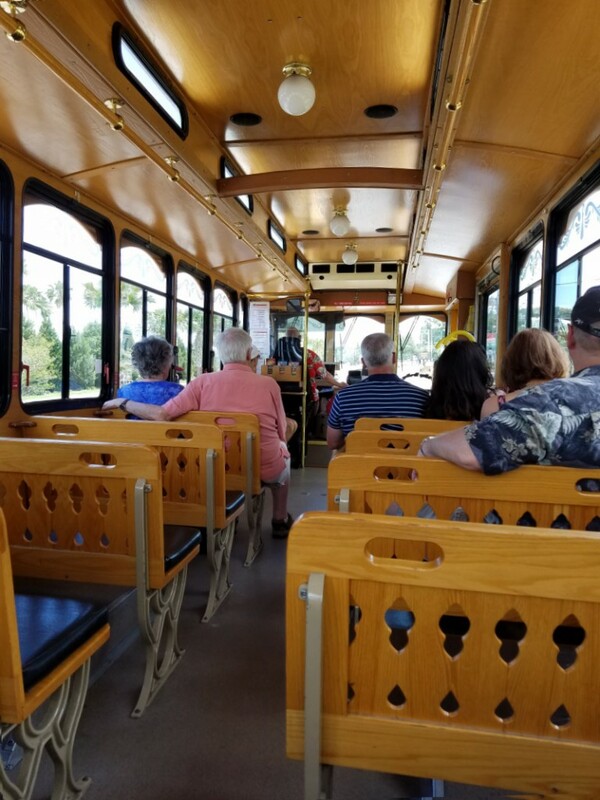 The Jolley Trolley, which I planned to use as transportation, did not come to Honeymoon Island. Between me and the trolley stop stretched Dunedin Causeway. The Dunedin Causeway is nothing to shake a stick at while on foot. That is the conclusion I came to about an hour later. It’s all fun and games on the sand, but when you hike a mile or more in flip-flops, things change. Still, it was a weekend and the Dunedin Causeway was hopping with activity. If there is a way to have fun at the beach or on the water, it is happening at the causeway. Plus, visitors can pull their cars right up to the shore so it becomes a combination of beach outing and tailgate party. Dunedin Causeway does not have the fantastic sands found on the shores of the Gulf of Mexico, and so the atmosphere might best be described as “relaxed.” Stated another way, as long as your clothes are on, you can pretty much do what you like. The good news is that, despite the potential for chaos, it’s actually a very well-behaved gathering place. The return road trip lacked the dazzle of the beginning, which was just fine, because by that time I was a bit tired. I walked the less interesting second half of the Dunedin Causeway and arrived at the bus stop where the causeway met the coastal road. The last bit of charm arrived when I boarded the trolley. It was one of the converted city busses, with an all wood interior, including the seats. Aside from the pleasant décor, each seat took up more room than a normal bus, creating a spacious seating area. Alas, I was not done yet. While I might have taken the trolley all the way to the beach, I knew better. The Clearwater Beach Ferry is a great way to go and so I got off of the trolley and walked down to the docks under the bridge to Clearwater Beach. I made it onto the ferry just before it left, a second lucky break in one day. The ride to the island of Clearwater Beach is another fun water adventure, even if it is “just” a water taxi. My ride ended at the Clearwater Beach Public Library, which has its own dock! To my fortune, the library is only a block from the office. I padded my tired feet along the waterfront of Clearwater Harbor and crossed the street to the office. Despite being a long and tiring day out, I was not sorry a bit. I also wasn’t fired from my job. I had taken a lot of pictures and created eight videos, which made it all worthwhile. I put my flip-flops away for a few days and considered myself lucky for having the experience. 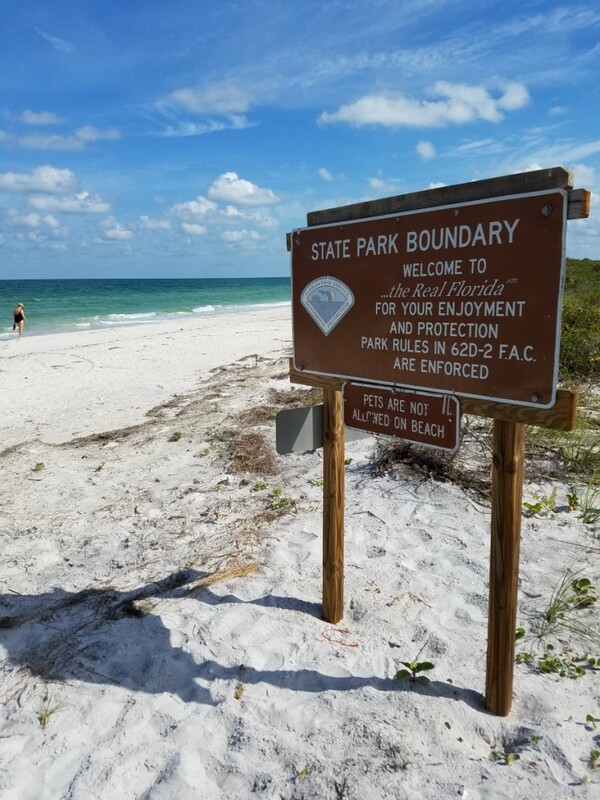 If you are ever in the Clearwater Beach area, you might want to give parts of this Clearwater Beach to Caladesi Island hike a try. 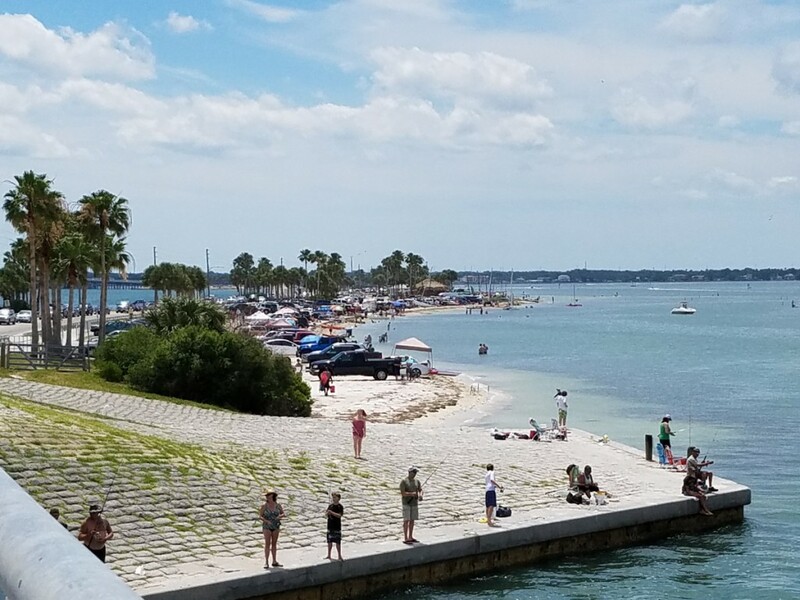 If you want to try the entire experience, I would recommend calling an Uber or Lyft cab to drive you across the Dunedin Causeway and then down the coast to Clearwater. Whether you will take the second ferry ride is up to you, but it’s pleasant and is a great idea on heavy beach traffic days. You can see the recordings of the live feeds below.